Cover. Blake. Nine Grotesque or Demonic Heads. Pencil, sheet 18.6 × 18.4 cm. Essick collection. ROBERT D. DENHAM is Fishwick Professor of English at Roanoke College, Virginia. WALLACE JACKSON, Professor of English and Director of Graduate Studies at Duke University, has written extensively on eighteenth-century English poetry, and in a recent series of essays has been occupied with Thomas Gray’s poetry. 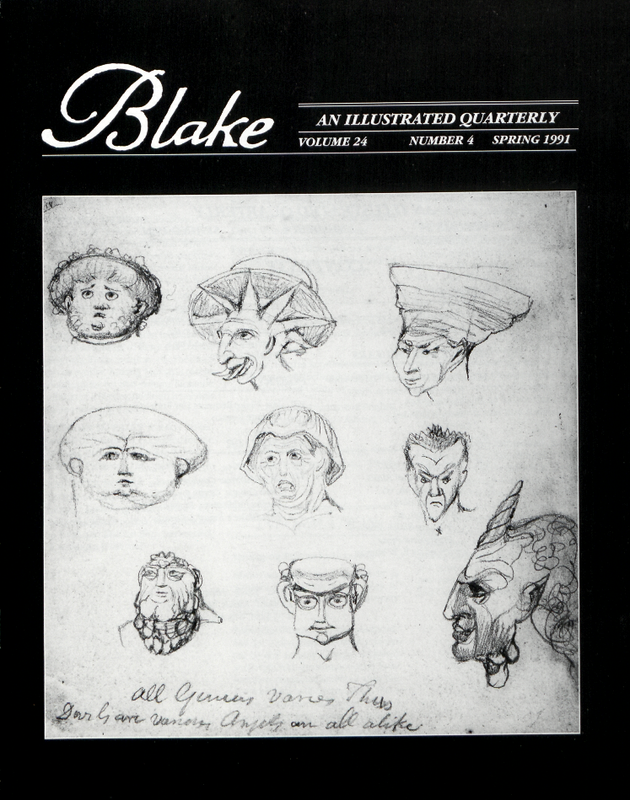 E. B. MURRAY retired last year from the University of Missouri-St. Louis, partly to spend more time on Blake but most immediately to finish the Oxford English Texts edition of Shelley’s prose works. Among Murray’s recent publications is a two-volume facsimile edition of a Shelley Bodleian notebook (Garland Press, 1988). MORTON D. PALEY recently edited copy E of Jerusalem, published for the William Blake Trust by the Tate Gallery and Princeton University Press. PAULETTE ROESKE teaches at the College of Lake County in Grayslake, Illinois. Breathing under Water, her first collection of poems, was published in 1988, and Endless Blue, her second, is seeking a publisher.